McLean: Holly's work inspired him to write ambitious song "American Pie"
Singer-songwriter Don McLean's hit song "American Pie" called the 1959 plane crash that killed Buddy Holly, Ritchie Valens and J.P. "The Big Bopper" Richardson "the day the music died." 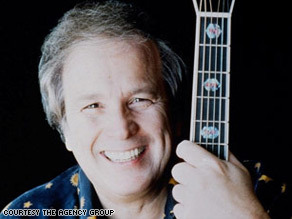 The following is based on a tribute McLean wrote for a book by Alan Howard: "The Don McLean Story: Killing Us Softly With His Songs" and on an interview with CNN.com. Don McLean says Buddy Holly was a musical genius who paved the way for other great rock acts. (CNN) -- Of all the unique oddities of my career, I am perhaps proudest of the fact that I am forever linked with Buddy Holly. I have heard it said that children dream in a different way than grown-ups. To them, the dreams they have for themselves are as real as reality is for grown-ups. With this in mind, I can say that Buddy was a huge part of my childhood dream. I bet if you ask any guitar player, he will tell you that he looked at record jackets and guitar catalogs more than anything else while growing up and dreaming. Long before I decided how I would use music or what kind of artist I would be, Buddy was there. When I listened to his music, a mood overtook me that was both happy and sad, and I often looked at the record covers while the music played. Buddy's music is so musical. The number of great recordings he made in his very short life places him at or beyond the level of any musical artist in almost any category. Elvis Presley never wrote songs, while Buddy composed a huge number. In my opinion, looking back, no rock act, not the Beatles, not the Stones, nor anyone else, can top records such as "Peggy Sue" or "Rave On." They are rock mountains that nobody has climbed. The diversity of Buddy's music is also profound. "Moondreams" and "True Love Ways" are musically as advanced as anything by the great popular composers. Gershwin or Berlin would have marveled at these compositions. Was it 'the day the music died'? His electric guitars were raw, but controlled like bullwhips. They jingle and jangle freely in "That'll Be the Day" and "Oh Boy," and they snake around in "Words of Love." The Beatles and the Stones became the behemoths they are on the back of Buddy Holly and the records he made before anyone made records or wrote songs like his. Aside from his geek image and his sudden and cruel death, his music is a wonder that still contains the potency of its original magic. Buddy was a genuine original. He was a genius. Buddy's death, for me, an impressionable 13-year-old, delivering papers, was an enormous tragedy. The cover photo of the posthumously released "Buddy Holly Story" and "The Buddy Holly Story, Vol. 2," coupled with liner notes written by his widow, Maria, created a sense of grief that lived inside of me, until I was able to exorcize it with the opening verse of "American Pie." I went on with my life and I was 13 and then I was 14, and still very deeply into Buddy and all the rock 'n' roll stuff. Then my father died, and everything changed in our family. We had nothing, basically no money coming in. My mother and I were alone, so the idea now began to focus on becoming a singer and a performer of some kind. I went to high school; I didn't really want to go to college, and I dropped out in 1964, and I got some jobs at a series of little coffeehouses around Canada. One was under a pizza parlor. Another was a roadhouse. They were owned by a guy who looked like a criminal. And I was just a child basically, so this whole thing was new to me, and I didn't find it terribly exciting. I spent a lot of time in terrible hotel rooms -- weeks at a time -- and I was just very lonely. I remember walking into this little bar or diner across the street from this one place -- the place under the pizza parlor, and there were Beatles songs on the jukebox and all kinds of Buddy Holly songs. I hadn't thought of Buddy in five years, so I would go over and have my little dinner, and I would play these songs and remember. And then my life went downhill again, and I went back to college, I got out of college, I pursued my career. Then, in 1970, I guess it was, I was preparing songs for the follow-up to my album "Tapestry," which came out before Carole King's album with the same title, and all of a sudden Buddy came in the room, and everything all came flooding back. It was 1970, 11 years later. This idea for a big song about America had been on my mind for a long, long time. I wanted some sort of a song that summed up the world known as America, and every time I would think about this I would end up doing something smaller than the subject that I wanted, and I couldn't find it. So all of a sudden this memory of Buddy's death had the dramatic power that I needed and started my mind operating on a different level. And I was able to see where this song had to go, how big it had to be, how long it had to be. Through my relationship with Buddy, I was able to discover my peculiar writing talent and, much to my amazement, help bring Buddy and his music back from the dead. In a sense, "American Pie" contains the spiritual connection to Buddy Holly that was always in me. It's as if we both gave each other new life. The opinions expressed in this commentary are solely those of Don McLean.